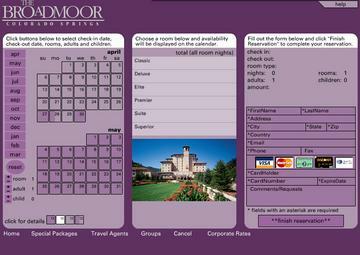 The Broadmoor Hotel online reservation system. Though very simple and unspectacular this proves to be a very effective and pragmatical interface design. It offers the end user maximum comfort in her ability to select, schedule and estimate a room reservation from an orderly set of choices. Rooms can be visualized and total price as well as availability are displayed in real time. The whole process including the ability to pay is included in one effectively designed screen. Very effective, very simple, a pleasure to use. Qunci Villas is creating a new benchmark for luxury living on the Island of Lombok with the opening of 2 luxurious villas: Villa Qusia and Villa Qunang. Villa Qusia is Qunci’s Premier, Luxurious 3-Bedroom Villa which is artfully positioned on its private property to take full advantage of the dramatic views of Bali’s Mt. Gunung Agung rising from the Lombok Sea. This allows our guests to enjoy one of Lombok’s most dramatic views and sunsets from nearly all the vantage points of this exquisitely designed and stylish villa.